Ever since I first moved to Paris, I've been intrigued by the Marché St. Quentin. The market is one of the few remaining covered markets in Paris, which makes it intriguing to anyone who wants to take a closer look at the French architect Rabourdin's work, or to anyone who wants to find out what is behind the market's cast-iron doors. For whatever reason, I've never been near the market during it's opening hours and everytime I've walked by the closed up, sizable, market building I've promised myself to make the trip at a time of the day when I can actually set foot in the place. Encouraged by a suggestion left by a reader on this blog, I made a point to schedule a visit. Here are some reflections on this month's Marché du Mois. St. Quentin is an impressive space, with soaring ceilings and ample space for vendors, most of whom seemed to have called in sick on the day of the week that I visited making the space seem even larger and more impressive. I imagine that weekends are more bustling and would advise any interested visitor to stop by during a rush hour, because the ambience would only add to the charm of the marketplace. I rarely recommend visiting a market at peak hours- waiting in long lines for your vegetables can be tiresome and should be avoided whenever possible as far as I'm concerned. However, I wasn't at all tempted to buy vegetables while I was at this particular marché. The fruits and veg seemed mostly imported from Spain and other neighboring countries- even the squash, that grows locally and lovely here, came from far away! Clearly, the produce is not the strong point of St. Quentin, but that isn't to say it has nothing to offer. While wandering through the stands I was delighted to find Pasteis de Nata, a delicious tradtional pastry, at a Portuguese food stand. Since Paris has a huge Portuguese community, it seems strange that it would be such a rarity to find Pasteis- but I don't think I've ever seen them anywhere else. I'm sure my readers know some good addresses to point me to to get my fix, but at least now I know for sure that I can find them at this market. The Marché St. Quentin is in fact a hub of international food sellers, which makes it both a special market and a specialist in niche items you might not find at other smaller, open air markets. While there I walked by African food stands, Italian delis, North African epiceries. There were also vendors selling region-specific French goods, like beer from the North of France. The choice of cheese from all over the country was also very tempting. 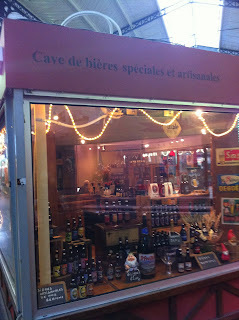 Another store that caught my eye was the beer boutique that sold unique and artisinal beers. There you can find both Gallia and Demory, two brands of Parisian beer that have been resurrected by young entrepreneurs and will hopefully find a home, and a brasserie, in Paris one day. If you feel like drinking your beer sur place the Marché St. Quentin has a friendly looking bistro that you can siddle up to and take a break from shopping or a pause for noshing. Whatever you do, take advantage of the fact that, with so few covered markets left in Paris, you've found a spot where Rabourdin's ceiling will keep you covered and his walls will keep you safe from the elements, making St. Quentin a cosy spot to duck into in any season.